This farm sold the land to the Armstrong family in 1911 that become the Armstrong Estates today. The water tank building and the red barn are most likely circa 1880. The stone barn was moved here from another farm on 7th Street in 1903. The legend says a group like the Knights of Columbus, or some such organization, helped the farm owners at that time take the barn down stone by stone, and timber by timber, and re-erect it here. They used it to keep the eggs cool. The fact that this was a chicken farm is one of the reasons we have such great soil, everything grows wonderfully here. The property produces approximately 10-15 tons of grapes, 2-3 tons of Olive Oil and assorted seasonal fruit (figs, apples, plums). 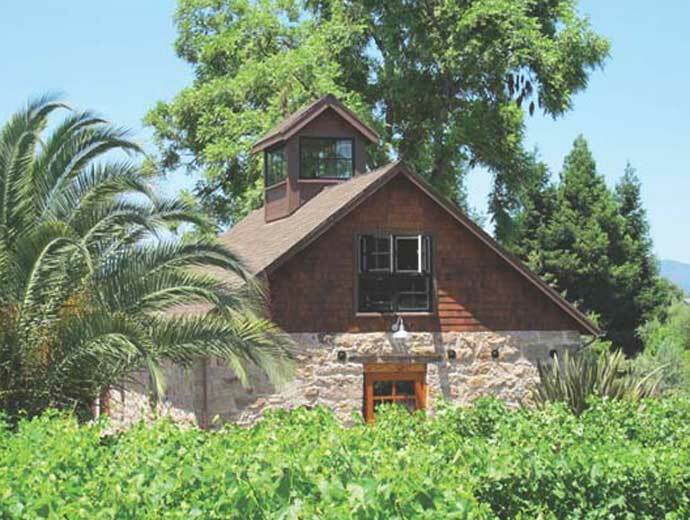 It formerly served as a turkey farm (providing fertile soil for the future vineyard) and is sustainably farmed. Learn more. From the Sonoma Valley Vintners’ and Growers’ Association: At the county’s southeastern most tip, and encompassing five very distinct AVA’s, Sonoma Valley wines radiate the region’s remarkable natural diversity. There are steep mountains and rolling benchlands and fertile plains. There’s cool coastal fog. There’s abundant warm California sunshine. And yet that’s just the beginning of the region’s endless diversity, both in climate and geography. It’s as if nature brought together the very best elements for winegrowing and assembled them in one place. Known affectionately as The Valley of the Moon, Sonoma Valley is both the name of the region and its largest AVA. Geographically, it’s bordered to the west by the Sonoma Mountains and, to the east, by the stunning Mayacamas Range. Climate: An “open” valley to the north and south, cool air flows down from the Pacific Ocean and up from San Pablo Bay. Soils: There are, at last count, over fifteen distinctly different soil series found and farmed in Sonoma Valley. Varietals: Of the dozens of grape varietals grown in Sonoma Valley, Chardonnay, Pinot Noir, Cabernet Sauvignon and Merlot are the most notable. To learn more about the characteristics of the Sonoma Valley Appellation, visit SonomaValleyWine.com. The Sonoma Valley AVA centers on the Sonoma Valley (also known as The Valley of the Moon) in the southern portion of the county. The appellation is bordered by two mountain ranges: the Mayacamas Mountains to the east and the Sonoma Mountains to the west. Along with being the area where so much of Sonoma County’s winemaking history took place, the area is known for its unique terroir, with Sonoma Mountain protecting the area from the wet and cool influence of the nearby Pacific Ocean. The Sonoma Mountains to the west help protect the valley from excessive rainfall. The cool air that does affect the region comes northward from the Los Carneros region and southward from the Santa Rosa Plain. Because the valley is cooled from the north and south, it is different from other California north-south-oriented grape growing valleys in the interior. In addition, the daily wind that makes its way into the northern and southern sections of the valley slows ripening, which prolongs hang time and promotes natural balance in the wines. In the appellations of the North Coast, the wind is unique to Sonoma Valley and Carneros. The soils of the Sonoma Valley, like the rest of the county are varied. One finds a wide disparity between valley floor and mountain soils; those found in flatter, valley areas tend to be quite fertile, loamy and have better water-retention while the soils at higher elevations are meager, rocky and well-drained. In general, the structure, rather than the composition of the soil, is the deciding factor where grape plantings are concerned. From LiveFromSonoma.com: The first vineyards were planted in 1823 by Franciscan monks at the northernmost Mission San Francisco Solano, which was the only mission built in Alta California after Mexico gained independence from Spain. Count Agoston Haraszthy, known as the father of California viticulture is credited with the introduction of the Zinfandel grape varietal. It wasn’t until the 1970’s & 80’s when the modern wine industry in Sonoma Valley started to pick up, and expand rapidly in following decades. The Sonoma Valley American Viticultural Area (AVA), was established in 1981 and is truly unique in that the Sonoma Mountains to the west protect the valley from excessive rainfall. This makes for concentrated fruit that is so important in winemaking. Learn more and view the Sonoma Plaza live webcam at LiveFromSonoma.com.